Trafford, PA. Born and raised in Canton, OHIO! Columbus, love the chilly fall air, colorful Midwest leaves and Ohio State Buckeye fans along the course! Is there anything better? Often Alone, I like early morning workouts! I run for good health, wellness and so I don’t go crazy! Per my husband, happy wife, happy life! 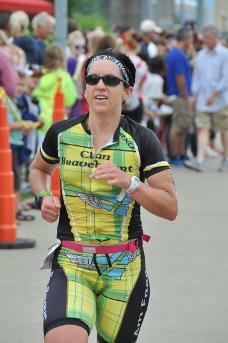 I had been chasing qualifying for Boston for a couple of marathons and kept coming up short. So at the Columbus marathon when I had over 20 minutes to run the last mile and could still qualify, I have never smiled so wide! I made everyone between miles 25 and the finish cheer for me! I have informally paced family and friends for many races. I love being a positive motivator and distraction for runners and see them reach their goals. The joy of seeing others succeed is reason enough! I paced my brother at his first marathon last year in Baltimore, Maryland and watching him overcome doubts and challenges to complete the race in the face of adversity! I promise to be bubbly, full of positive energy and motivating. It will be like a mobile block party! The first half of the race sets up the second half of the race. It takes patience and discipline to not go out too fast and keep reserves for the second half! Also, hit every fluid station even if you do not think you need it! If you feel thirsty, its too late! Remember, we run because we can and it should be fun! Take pride in your accomplishments, but most of all enjoy the experience!